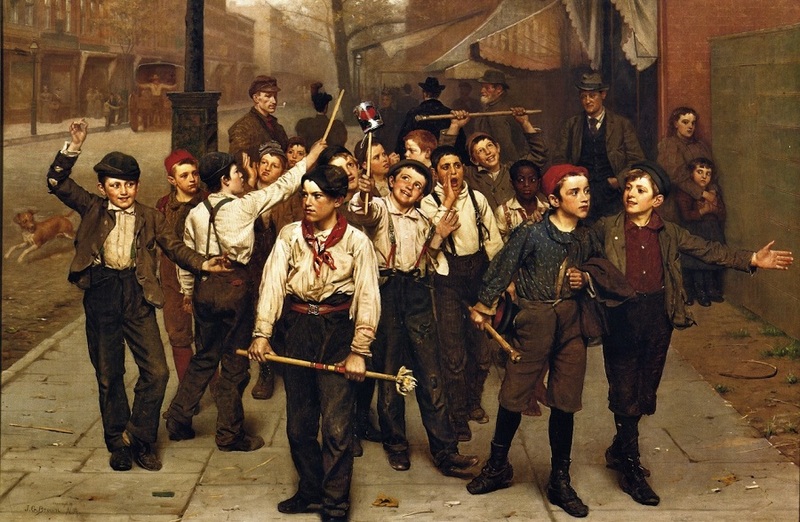 The Gang, circa 1894, oil on canvas by British-American painter John George Brown (1831–1913). Image courtesy of The Athenaeum. Crane was notorious for changing his mind about his books and their contents, and so his agent and his publisher ignored his latest brainstorm and proceeded with the original volume. They did, however, draw up a contract for a book of new Whilomville tales: including the four new stories he had completed, “at least twelve stories should be supplied, so as to bring the matter up to about 40,000 words.” The finished book was due in November. Then, in October, when Crane was nearly done with the required dozen, his common-law wife Cora wrote to his agent and proposed extending the series to a total of eighteen tales. It’s not clear who backtracked from this last-minute pitch, but in the end Crane submitted thirteen stories before the deadline the following month. Part of Crane’s inventiveness in what became principally a series of tales about children is that he invested virtually all of them with mature ideas, essentially the same themes he employed in his adult fiction, issues of pride and humiliation, the illusion of stature and deflation, the desire for bravery and glory, the reality of cowardice and defeat. Notes: The English system of fagging, mentioned midway through the story, refers to the tradition in British boarding schools in which younger students were personal servants to senior boys. Later in the story, Jimmy argues with a friend over the merits of two Uncle Tom’s Cabin companies. In the 1880s and ’90s, acting troupes crisscrossed the country, staging competing versions of the wildly popular stage adaptation of Uncle Tom’s Cabin. Advertisements boasted how each show offered the most extravagant spectacle, including the use of numerous live animals—particularly bloodhounds. The child life of the neighborhood was sometimes moved in its deeps at the sight of wagon-loads of furniture arriving in front of some house which with closed blinds and barred doors had been for a time a mystery or even a fear. . . . If you don't see the full selection below, click here (PDF) or click here (Google Docs) to read it—free!